On Tuesday July 5, employees of the Wisconsin Department of Corrections (DOC) will return from a long holiday weekend of cooking out and summertime patriotism to a day of protest at their workplace. Starting before the office opens and continuing until the DOC commits to stepping down from the use of long term solitary confinement, we will protest in fierce solidarity with the prisoners who have been refusing food since early June. Cesar DeLeon, LaRon McKinley Bey, Uhuru Mutawakkil kicked off a hunger strike on June 5, they called it the “Dying to Live Humanitarian Food Refusal Campaign Against Torture.” Dozens of prisoners were ready to join them initially, but DOC retaliation, harassment, transfers and threats divided and repressed many of them. Ten or so prisoners were on board on June 10 and 11, when supporters held the first rallies in Milwaukee and Madison. On June 17, the DOC made good on their threats by force feeding the prisoners. Seven days without food is not long enough to seriously endanger the human body, and the risks of force feeding certainly exceed the benefit, so this action was clearly about torturing the prisoners to break their protest. Our most recent correspondence confirmed six prisoners are still refusing food, DeLeon and McKinley Bey, as well as Joshua Scolman, Parish Golden, Lamar Larry and Shirell Watkins. At least two, but possibly all of these people have been subjected to regular force feedings for the last ten days. There may be other participants in the hunger strike who remain isolated from the other prisoners and hidden by the DOC, who refuses to answer any questions at all. Uhuru Mutawakkil, who was transferred to Columbia CI to isolate him from the others, recently began accepting food again because his body and mind were not accepting the starvation and force feeding. He wanted to focus on drafting a specific proposal of new rules for the DOC to follow as well as lawsuits against the DOC for the force feeding. [UPDATE 6/30: WI DOC has begun force feeding Joshua Scolman. He has a deviated septum so they could not get the tube down his nose, but kept trying until they burst blood vessels in his face. He was taken to the hospital because so much bleeding-stayed one and a half days with 3 intravenous tubes. Doctors said his liver is failing. The DOC wants to implant the feeding tube in his stomach directly. They would rather perform a major surgery on a prisoner they have already hospitalized with their brutality than negotiate. If you would like to get involved from afar, please donate to the Milwaukee IWW to help them mobilize for Tuesday. We support all of these prisoners and recognize that, whether they refused food for only one day or have endured swallowing a tube shoved up their nose by unfriendly DOC staff multiple times a day, they are resisting the practice of solitary confinement, and we will continue to resist alongside them. There are many things in the works for July 5th, diverse tactics and actions are being considered and planned. We will have a picket line that DOC employees will have to cross, there will be speeches and re-enactments of solitary confinement and torture endured by prisoners, mass call-ins and campaigns. Civil disobedience, banner drops and other more confrontational activities are on the table, but the organizers will maintain a lawful protest space as well, to protect the safety of formerly incarcerated and potentially undocumented participants to the best of our ability. 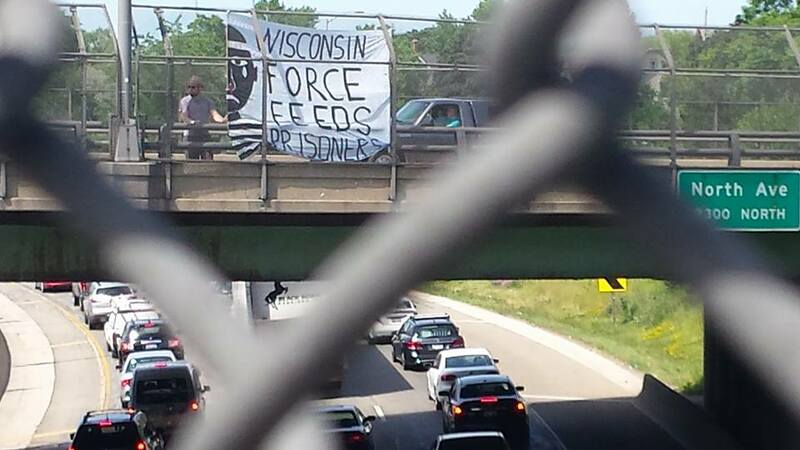 Leading up to the day of action, the Milwaukee IWW has begun a series of overpass banner actions to raise awareness. The Overpass Light Brigade will also do a solidarity demonstration. Over the holiday weekend there will be constant reminders that the US is not the land of the free and that Wisconsin prisons are torture chambers. 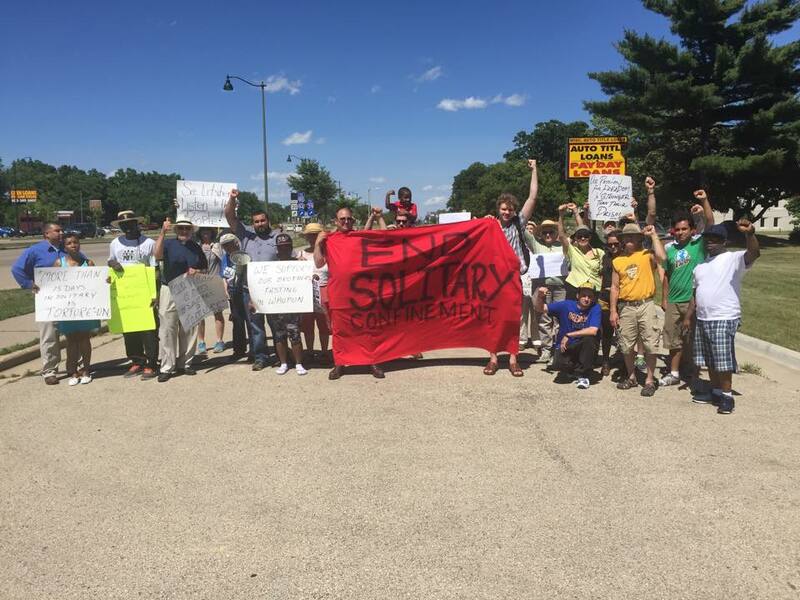 A broad coalition of prisoner support and advocacy groups have been coordinating support for the hunger strike, including the Incarcerated Worker’s Organizing Committee of the Milwaukee IWW, Forum For Understanding Prisons, Ex-Prisoners Organizing, members of the faith-based WISDOM Network, and others. Acts of solidarity in other states are encouraged, please send communiques about them to iww.milwaukee@gmail.com. Thank you. This entry was posted in General and tagged action, cesar deleon, Dying to live, force feeding, hunger strike, incarcerated workers organizing committee, industrial workers of the world, LaRon McKinley, milwaukee, solidarity, Solidarity action, wisconsin on June 29, 2016 by Prisoner Support.